"I love that we get a built-in clean slate every January 1st" .... I've had that same thought over the past few days. I absolutely love the beginning of the year. It's built-in fresh clean start and I love it. It feels like a deep breath and I look forward to it every year. 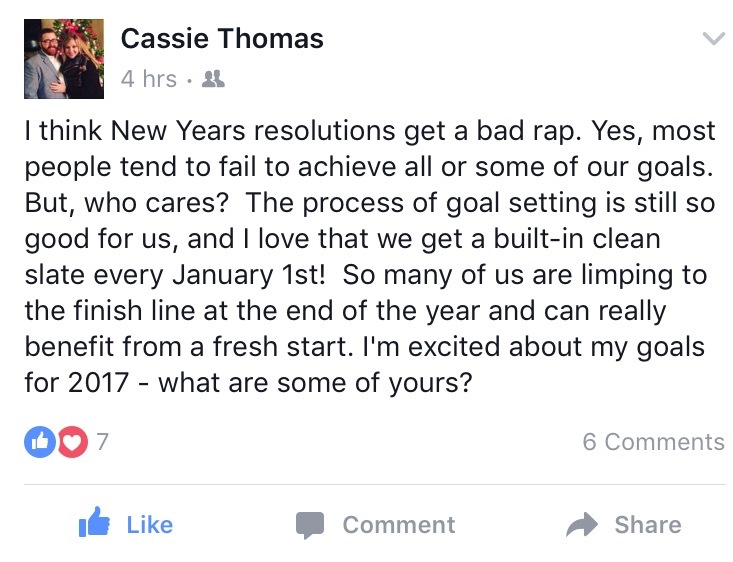 Four years ago, I started looking at resolutions a little bit differently. I got the idea from my dad, who got it from here. The idea is to focus on one word for the year. A word to inspire, challenge, and drive you closer to dependence on the Lord. It's basically choosing a core, essential idea for the year. What one way do we most want to see God move in our life? In 2013, the first year I tried this, my word was "GRACE". Never did I expect to have my world wrecked that year, from the inside out. I didn't know that to fully understand what that word meant, I needed to be brought to a place where I could understand my desperate need for grace. In 2014, after surviving 2013, the Lord gave me the word "HOPE". And it truly was a gift. I don't think I have learned a more profound spiritual lesson that this one. In 2015, I felt the need to focus on "JOY". This year, God taught me how he has ransomed and redeemed our fear by sending us his son Jesus, who is the good news and great JOY for all the people. This past year has been a lesson on learning to depend on the Lord and how he draws us to Himself out of His loving kindness. It has also been a good opportunity to practice extending kindness to others. One of the main things that I tried is so small, but turned out to be so profound: to smile at people more. It may seem like such a tiny thing, but I am AMAZED at the response of even perfect strangers I came in contact with throughout the days. There was not one person that didn't smile back at me. But the really profound part happened on the inside. By the simple act of smiling at someone, I was training my heart to respond in kindness to people. It was just this small, tangible thing. You should try it! About a month ago, I started asking the Lord to give me a word for this next year. The past years, I have always had an inkling or an idea or a couple times it was just BLARINGLY obvious. This year it wasn't that way at all. I had no idea. So I just started praying about it. My favorite time to pray is in the shower because I am all alone, can shut the curtain to everything else, and can honestly talk to God. So everytime I was in the shower, I prayed about it. I started thinking through the ideas of contentment, fulfillment, and happiness. What does God really think about those things? What does His word say about these things? What does He want me to know about these things? The Lord brought the Beatitudes to my mind and this particular chunk of scripture found a resting place in my heart. Blessed are the poor in spirit, for their is the kingdom of heaven. Blessed are the meak, for they shall inherit the earth. Blessed are the persecuted for righteousness' sake, for theirs is the kingdom of heaven. 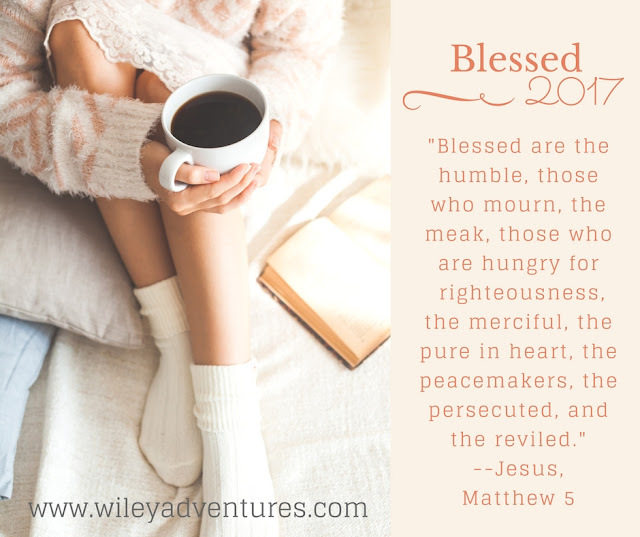 Blessed are you when others revile you and persecute you and utter all kinds of evil against you falsely on my account. 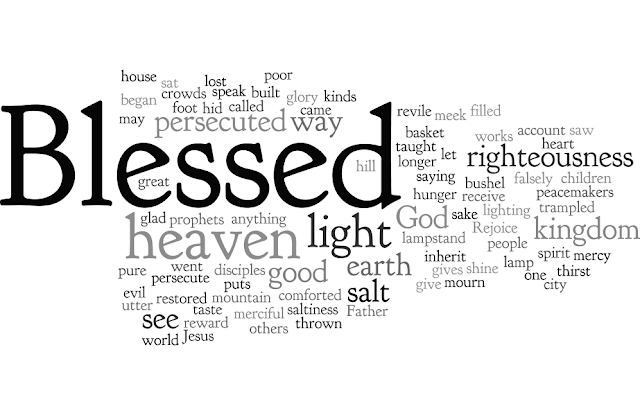 Rejoice and be glad for your reward is great in heaven, for so they persecuted the prophets who were before you. One of the things that came to mind when praying through all of this was a sermon series my dad had preached several years ago on the Beatitudes. I remember that he said that word "Blessed" translates to mean "happy". Happy are the poor in spirit, Happy are those who mourn, Happy are the meak, etc.... It's this whole idea of fulfillment and contentment, and here is a passage of scripture that Jesus himself tells us how to obtain. I really want that. I want to be one of those people who is content and fulfilled and happy. I want to be blessed. It's a new opportunity to pursue after the Lord and what He has for me in this next year and I'm really excited about it. 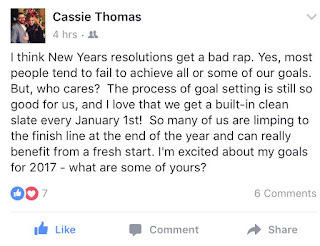 I really really love hearing other people's resolutions or words for the year or their goals! Feel free to share in the comments or connect with me on Facebook!